These two weeks in Tacloban felt like two months. Sleep deprivation is a torture that comes hand in hand with adrenalin and its little cousins, caffeine and nicotine. The first emergency teams to be sent to the field are like high voltage fuses, people who volunteer to go at the drop of a hat, and whose accumulated experience throughout many of these operations is essential. Damien should be the most exhausted of all of us. He’s responsible for a pool of 30 international staff who live between the 5th and 8th floors of a tower that has lost its lift. Since day one, this tireless Australian has been running from flooded shop to ripped open warehouses, up and down stairs, striving to meet the needs of everyone in a city where everything has vanished. To help Damien, my friend Jason sent his right-hand-man Chico. Without hesitation, Chico immediately left his sea kayaking centre in Cebu to come and help his childhood friend. Twenty-five years ago, the duo used to fight for pretty girls. They now fight to rescue their community with their happy team of cavemen. When he isn’t roaming the most inhospitable areas for humans on the planet, Damien lives in Melbourne and cooks, for himself, for his friends and occasionally for clients. I met him for the first time in 2011 in the south of Niger, where temperatures reach mercury highs. He and Clarke, a welcoming American nurse normally based in Hawaii, were setting up a temporary centre to treat cholera cases reported in a village they were actually not allowed to enter, due to a murky tale of local traditions. Back then I had already been impressed by his ability to create comfort in the worst conditions. In the middle of the desert, the smallest movement required a superhuman effort for the average person. But Australian MSFers don’t belong to this category. Experience in the central Outback desert or working in indigenous Australian communities turn out to be invaluable assets for adjusting to humanitarian environments. The pair of fifty-somethings lived in the shade of a big acacia tree under mosquito nets fixed to cots. The low heated fire allowed them to always have warm tea and to boil water before dissolving a tasty culinary solution only Damien seemed to know the secret of. 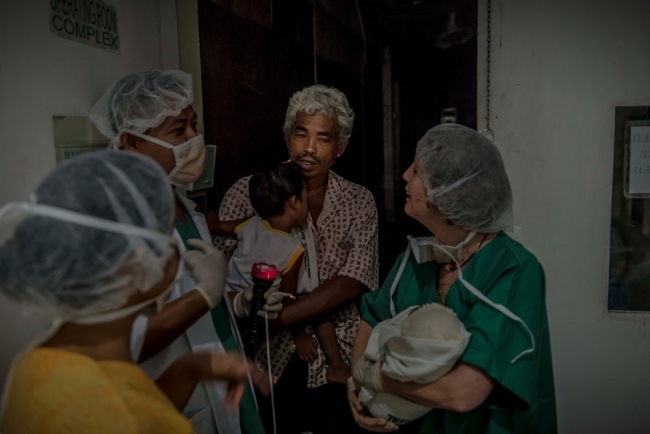 At 2 am, Damien was contemplating his own insomnia in the deserted MSF hospital courtyard in Tacloban. 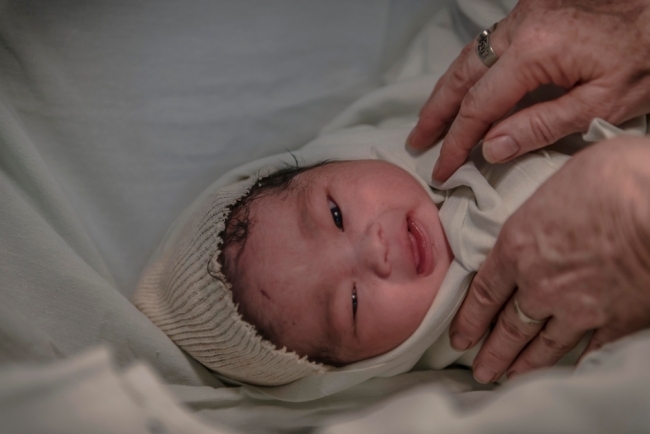 That’s how he was able to send me a text letting me know that the first Caesarian section was about to begin. It’s the middle of the night. You’re so exhausted that even if you were able to sleep, you would only dream about sleeping. An old pal calls you to offer you a bloody night in the operating room of a hospital devastated by a deadly tsunami. There was only one possible reply: SEND ME A CAR! Once on site, I have to undress, put on a white coat, a mask and a stylish hygiene cap on my hair (implying that there is some left! ), then disinfect my hands before being introduced in the holy of holies: the operating theater. Bethany’s one didn’t suffer from the catastrophe. For obvious hygiene reasons, operating rooms usually don’t have any windows and are well isolated from the rest of the buildings. We simply replenished some of the equipment with the new supplies which had arrived with the inflatable hospital. 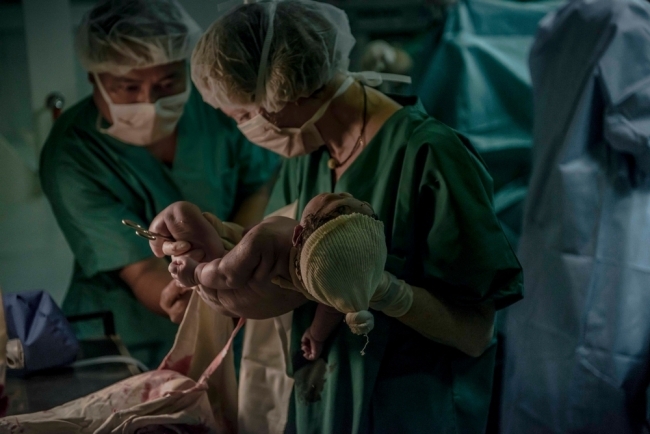 Ideal timing: Tomoaki Atsuni, a Japanese MSF surgeon who has seen much worse in Syria or in Nigeria, is just starting to pull the baby’s head out of the incised uterus. Next to him, midwife Margaret Barclay, also an Aussie from Melbourne, is ready to receive the precious package. The child seems lifeless. Yet Margaret doesn’t show any sign of panic. No haste, just method, precision, calming force and quiet strength. Her smallest movement would make the All Blacks scrum faint. The expression “surgical procedures” takes its full meaning here. Each minute that passes makes me fall apart a bit further. I can’t help but think that I may be photographing a dead kid. 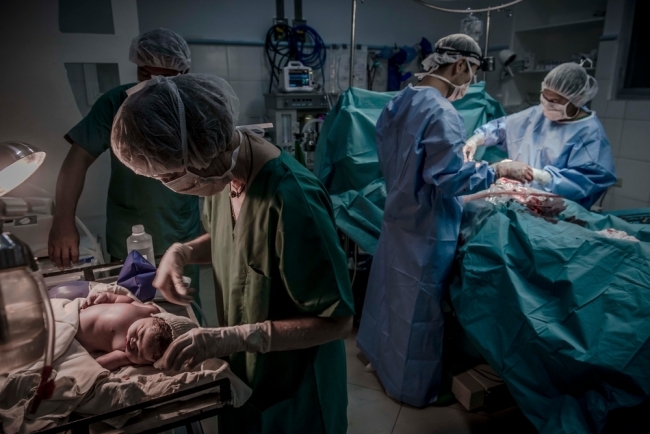 And then, suddenly, a first cry, a cry of relief, for the baby and his mother Merly, for Margaret who didn’t let anything show, for me pallid underneath my surgeon mask, for all of us. The atmosphere finally lightens up. Curious already, the little one, all wrapped up in a bundle, is introduced to his mum who remained conscious throughout the whole intervention. The choice of name lies with the dad. Ronelo Calapas has the empty look of those who have just been through hell. Their town of Mayorga, north of Tacloban, was destroyed by the typhoon. The grey-haired forty-something ended up on the road with his three children and his wife about to give birth to the fourth one. After several days spent navigating among debris, they were able to join friends and to find a tent to settle. I insist that he tells me what he and his family need. He turns down all my offers. His family gets enough material assistance and food from the government. Ronelo chooses the name Romy for his new son. He is carrying in his arms the young older brother, Rony. It’s going to be confusing at home when it comes to names! It was a close call for Romy. His untreated diabetic mother had an infected foot. 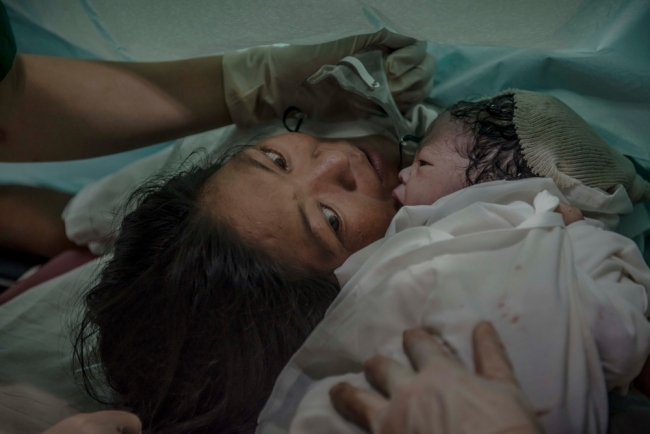 The stress generated by the catastrophe contributed to turn what was supposed to be a simple fourth delivery into a long and dangerous ordeal both for her and her baby, hence the decision to perform an emergency C-section and Romy’s interminable reanimation. Complications due to interruptions in the treatment of chronic diseases like diabetes, asthma or hypertension constitute an important part of our patients. For example, strokes are more frequent than one would expect. Our British medical coordinator Natalie explains that high blood pressure is a common problem in the Philippines, partly due to a high fat diet. Filipinos are also heavy smokers. I actually joined them the minute my electronic ersatz ran out of battery. I return to Jason’s hiking club the following evening. As a proud humanitarian, raised near breweries in the north of France, I have picked up the habit of bringing them what Filipinos need the most after such intense and hard-working days: beers. Jason would like to reopen his Bukid outdoor shop as early as possible, even though he thinks tourists won’t be back for at least another six months. I advise him to direct his offer at humanitarian workers, since it looks like a number of them are going to stay around and enjoy a warm winter. He’s reluctant in taking advantage of a situation like this. I convince him that he and his business are also the victims of Yolanda, and as such, legitimate beneficiaries of international aid. Jason seems to have relaxed a bit since our first encounter two weeks ago. He has put his gun away and is considering escaping for a few days to see his wife and daughters in Cebu. I am also getting ready to leave the area and go back to Sydney. The gap in energy with the new MSF team is starting to show. I can already feel the nostalgia of a past which is only two weeks old. Or maybe it was two months?